The E-Trike LT leaning electric tricycle has a novel feature that is operated by a lever on the handlebar. The rider flips the lever and the front frame section can lean left or right into corners while the rear wheels stay steady. This feature is ideal for those who prefer the “leaning” feel of a bicycle. By having the ability to lean the trike when cornering there is additional stability and it is easier for bike riders to adapt to riding a three wheeler. The battery pack is placed below the basket to keep the center of gravity as low as possible. Perfect for Getting Around Town; Shopping, Visiting Friends & Exercising. Your Dog Will Also Love it. …48 Volt Lithium-ion Batteries with Speeds of 25 kph and a 40 Plus kilometre Range Per Charge. 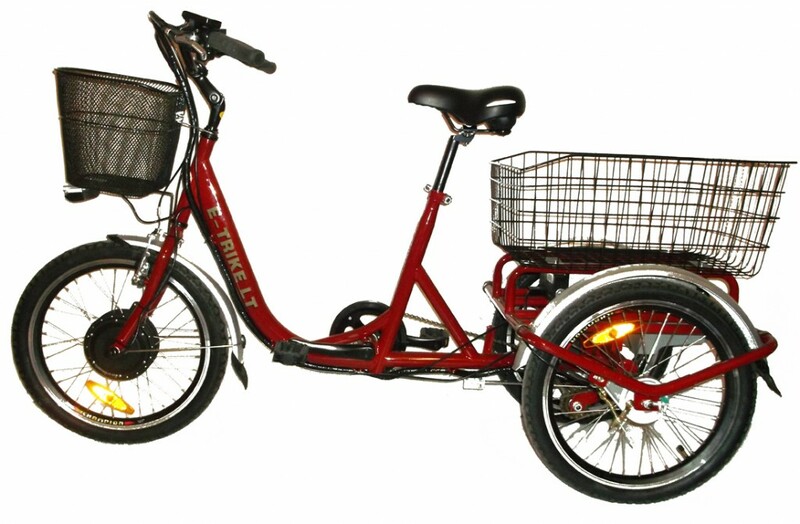 The E-Trike LT Operates in Electric Power Mode and Also has a Pedal Assist Mode which Makes Pedaling Almost Effortless but Extends the Battery Power and Gives Some Exercise. Approximately 5 Feet in Length & 22 inches Wide. This Lightweight Electric Tricycle Makes It Ideal for Smaller Size Riders and Storing. The E-Trike LT is Leaning Electric Tricycle. A Unique Feature that is Operated By a Lever on the Handlebar. The Rider Flips the Lever and the Front Frame Section Can Lean Left or Right into Corners while the Rear Wheels Stay Steady.